Stock index futures had a climatic mark up on Tuesday that came at the end of a swing up. Pit session gaps were left which can come into play next week, if not today. The Sps have the appearance of an hourly bull flag. however, if it takes out the low marked off, then the dailies will turn back down. If so, there is a triple top in place in the Dow. If the market punches up to the upside, watch for a retest of the two day high in the SPs. Significant levels are marked off on the chart above. ECB meeting is expected to clarify just how long interest rates at zero can last. June’s ECB meeting triggered huge volatility. daily charts, but traded down off news on Wednesday evening. GC has a three bar triangle. 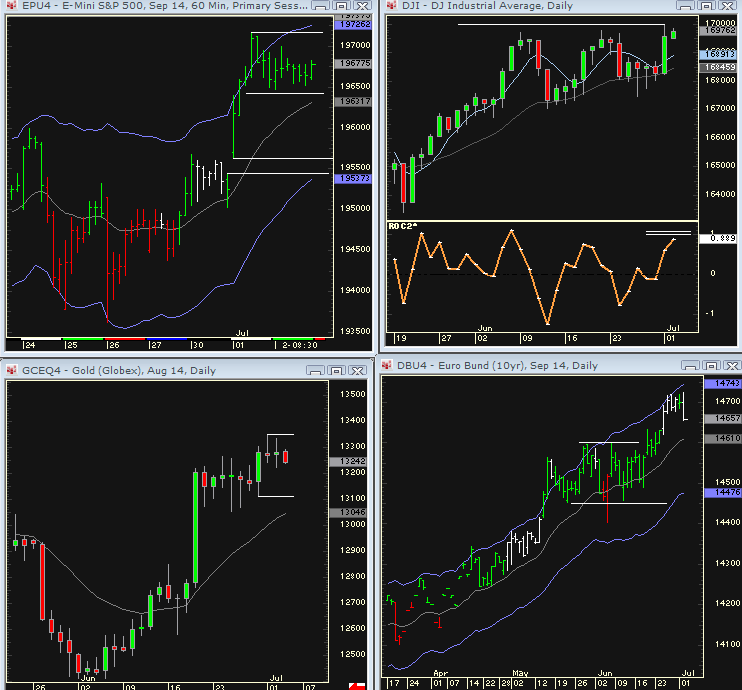 The daily charts can correct momentum divergences. Bonds have two day high to low and are oversold. A reaction back up will form a grail sale for next week. SHORTENDED TRADING DAY TODAY in stock index futures! Have a fabulous holiday! Gob Bless America~!